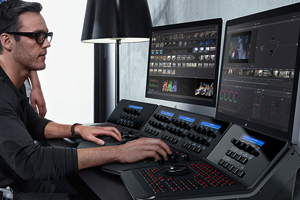 Version 12.5 of Blackmagic Design's grading and editing software suite DaVinci Resolve is now officially available for download. The software has been going through major updates and is finally out of beta testing. You can download the DaVinci Resolve 12.5 and Resolve 12.5 Studio directly from the Blackmagic Design website. This entry was posted in Post Production, Cameras, News and tagged filmmaking, post production products, Blackmagic DaVinci Resolve 12.5, Editing, Blackmagic Design on 15th June 2016 by Visuals. Join our experienced panel of product experts as we give an in-depth review of NAB 2016 in this interactive webinar. Fresh from the exhibition halls in Las Vegas top DoP Alister Chapman will cover his highlights from the show and discuss the implications for the various sectors of the TV & film industry. This webinar is a must for anyone interested in new products and technology within the TV industry. This entry was posted in Webinars and tagged AV production, post production products, filmmakers, Film industries, TV, production equipement, NAB, Webinar, NAB 2016, Cameras on 4th May 2016 by Visuals.